As you can tell from some of my recent posts, I've kind of a health tip junkie. I love doing things that are quick and easy to improve my health for the better. Some health tips I do are big like making time to exercise for an hour each day, and other tips are small like doing the neti pot or oil pulling. In the grand scheme of things though, it's those quick and easy tips that sure are easier to stick to and do on a daily basis. 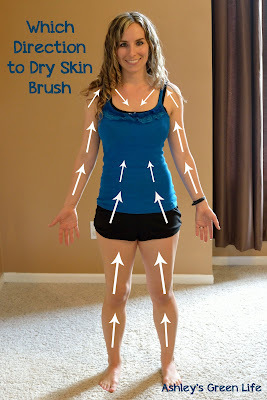 So today's tip is a quick one called "dry skin brushing." The name itself is pretty self explanatory in how you basically brush your skin, when it's dry, with a brush. That's all! It only takes me a few minutes each day, and yet the benefits are much more than you would think. From what I've read, your body has two circulatory systems...one is blood and the other is lymph. Our heart pumps blood, but there is no pump for the lymph. That's where we come in. By exercising and doing activities like dry skin brushing (which stimulate the lymph to move) we encourage our lymphatic system to circulate. That's all fine and dandy to say, but truly the benefits that come from a getting your lymph system moving include: enhanced immune system, increased ability to absorb vitamins A, D, E, and K, and increased detoxing of the body, just to name a few. A simple, natural bristle brush is all you need. You can find these at your local health food store or grocery store and they only cost a few bucks. or you could get them on Amazon like this one here. Mine came with a handle, but I find it's easier to skin brush without the handle. Don't worry if your's looks different than mine, as there are all different kinds. Some people even use loofahs or skin exfoliating gloves, so whatever you can find that's similar to a skin brush will work just fine. Also, I clean my brush once every two or three weeks by rinsing it with a mild castile soap and water and then allowing it to air dry. With this kind of maintenance, I plan on brushing with this brush for a long time to come! A key to dry skin brushing is to use long, sweeping strokes towards your heart. Some people say to do circular strokes, but truly it's up to you. I became obsessed in finding the "perfect way to skin brush" but all I did was exhaust myself Googling and coming up with different variations. For me, I love the long sweeping strokes, but maybe you'll like the circular strokes. I say, do what works for you! Or as the amazing Kris Carr said, "It's not rocket scinece, it's dry brushing!" 1. Starting at my feet, I brush up my legs using long strokes. Making sure to get the front and the back of the leg. 2. Next I move to my thighs. leg and do the exact same thing. could also go in a circular motion. in my arm pit area...even though it sounds very strange! go in small, gentle strokes DOWN towards my heart. Repeat on the other arm and then your done! Hard to believe so much good can come from one simple brush! But once you give skin brushing a try, you'll know what all the hype is all about and hopefully you'll look forward to doing this quick and easy health tip daily like I do. And hey, softer skin, increased detoxing, and reduced cellulite helps a little too right?! Have you ever tired dry skin brushing? What did you think about it? Or what kind of brush do you like to use? Share below! Disclaimer: I am by no means a doctor. Everything I post on here I've learned from books, online research, and by talking with naturopaths/chiropractors/and other alternative health experts. So I'm not the end all to be all. What works for me, may not work for you,take it... but it doesn't hurt to share right? Can you clean your dry brush with vinegar?